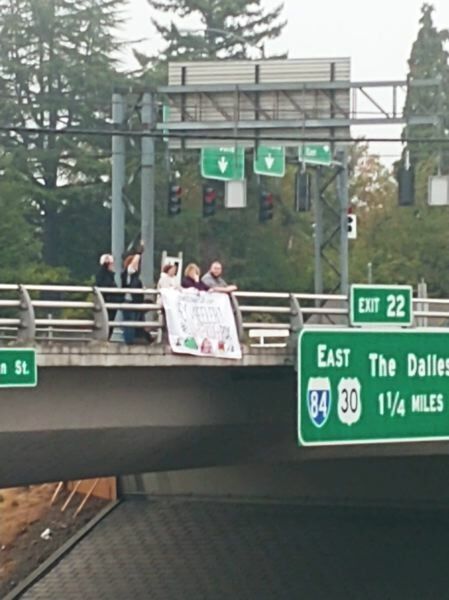 Montavilla Initiative members unfurl banner decrying campers off I-205 overpass on Monday, Sept. 17. A band of residents in Portland's Montavilla neighborhood say there's a big difference between criminalizing homelessness and letting property and drug laws go unenforced. "The police don't respond to it. The mayor doesn't respond to it. They feel like they can build themselves out of this situation," said local resident Jeff Church. "We have working-class families who are living paycheck to paycheck who are being robbed with impunity." Church — a board member for the Montavilla Initiative — is joining with neighbors in Lents and Brentwood-Darlington to launch "Enough is Enough PDX." The city-wide campaign seeks to force decision-makers to address livability issues and quality-of-life crimes. 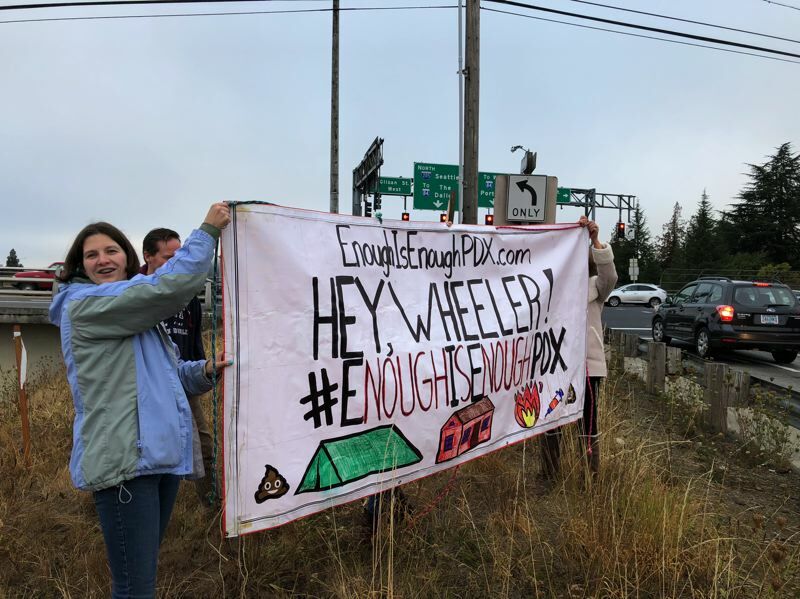 To start, the group created a banner decorated with drawings of tents, fires, hypodermic needles, the poop emoji and a message reading "Hey, Wheeler!" Motorists passing underneath the Glisan Street Interstate 205 overpass watched the protest unfurl from 7 a.m. to 8 a.m. on Monday, Sept. 17. Bounded by I-205 to the east and the curves of Interstate 84 to the north, Montavilla's 7,000 or so residents live in the shadow of Mt. Tabor but don't enjoy the same property values as their wealthier neighbors to the west and south. Unpermitted homeless shelters are a perennial issue along the I-205 multi-use path, and Church says the 82nd Avenue MAX station gives campers easy access to Montavilla Park. "There are a lot of people who are service-resistant, who are refusing service," said Church, a Portlander since 1993 who moved to the neighborhood three years ago and works from home. "We need to help these people realize that what they're doing is affecting people in this neighborhood horribly." It's fair to say that the Montavilla Initiative doesn't see eye to eye with the Montavilla Neighborhood Association. The city-funded association acknowledges that trash, human waste and needles have piled up in public spaces, but the neighborhood association also asked the government to stop the sweeps of the two-square-mile district in a resolution passed on Aug. 13. "We need to move toward a better long-term solution than public relation sweeps when enough complaints pile up in certain areas," said David Linn, the 36-year-old board chair for the association, who was born off 82nd. "That just moves the problem around." And while both groups want to see an end to homelessness, the Montavilla Initiative members believe law and order can't wait for a solution that's still a speck on the horizon.